Moss & Barnett is pleased to announce that Aaron A. 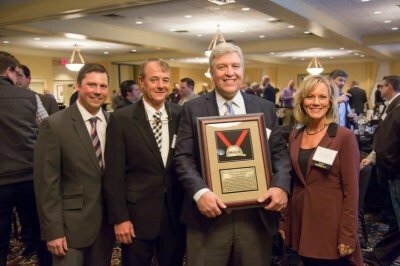 Dean received the Minnesota Subcontractors Association’s 2017 “Champions Award” at its Annual T.O.P.S. Awards Dinner held on January 23, 2018. Eight years ago, the Minnesota Subcontractors Association (MSA) decided to recognize special individual members for their long-term work to enhance the business environment for subcontractors and for outstanding contributions to MSA. Moss & Barnett attorney, Curtis D. Smith, was the first recipient of the MSA Champions Award in 2010. Aaron is a member of the firm’s construction law and litigation teams. His 20-year legal career spans all facets of the construction industry. He has a contractor-side construction law practice, representing general contractors, subcontractors, and suppliers. In addition to his role as legal advisor, Aaron is a sought-after construction industry thought leader, speaking frequently at key trade events on timely construction topics and serving as an instructor for national and local contractor trade groups.